If you’re dealing with the high cost and complexities of delivering reliable wide area connectivity over traditional carrier-based networks, you’re probably considering some form of software-defined wide area networking (SD-WAN). With the variety of constraints that you face, selecting the right SD-WAN solution for your enterprise may require a few compromises. Security, however, should not be one of them. There are various models for combining SD-WAN and network security, but only one that can truly be called “secure SD-WAN.” Fortinet, the most trusted name in network security, has leveraged its industry-leading FortiGate Next Generation Firewall (NGFW) to deliver integrated best-of-breed SD-WAN capabilities. 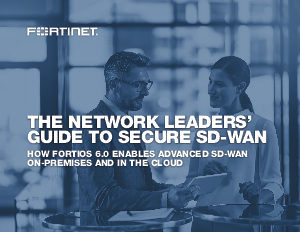 Powered by the new Forti OS 6.0 operating system, SD-WAN enabled FortiGate solutions provide the right level of service for every application, while ensuring effective protection from advanced evolving threats across your distributed enterprise.